In 2010, Nara (now the hometown of what is perhaps Japan’s largest tea gathering) celebrated the 1,300th anniversary of its ascension as Japan’s imperial capital. Nara was Japan’s capital during the Heian period (710 to 794) before it was moved to Heian-kyō, what is nowadays known as Kyōto. Contemporarily, Nara city is the capital of Nara prefecture, and still houses some of the greatest and oldest Historic Monuments of Ancient Nara. Specifically Tōdai-ji, Saidai-ji, Kōfuku-ji, Kasuga Shrine, Gangō-ji, Yakushi-ji, Tōshōdai-ji, and the Heijō Palace are noteworthy. The people of Nara take pride in their cultural heritage and actively seek to maintain the ancestry that lies at the origin of this country’s wide range of traditions. These customs include traditional rituals and processions conducted at the old temples and shrines, arts and crafts practiced and performed at the court, etc. The rite of tea (Tea ceremony) is believed to have its roots with Murata Shukō (1423 to 1502), who preferred implements of native manufacturing for the consumption of tea. This style later became known as ‘wabi-cha‘. It is said that he first came in contact with tea through attending ‘tōcha’ gatherings (or blind tasting contests) by tea connoisseurs. The competitive aspect however held no appeal, and he rather looked to tea as a stimulant to stay awake during his studies. It is this episode in Shukō’s life that is featured in this epic tea gathering. As the progenitor of Japan’s most culturally revered praxis – even abroad – it is strongly felt by the people of Nara that the tradition of Tea also has its roots in the old capital. 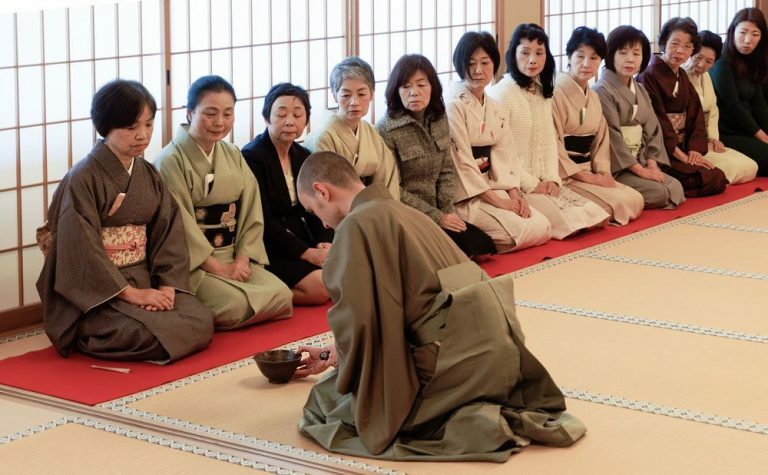 This grand tea gathering seamlessly combines Nara’s most ancient cultural sites with the tradition of the rite of Tea. Every year during the second week of February – and this year for the 5th year, the Juko Tea Gathering: Nara Tea Congress is held. The event extends over the span of one whole week, and is hosted throughout Nara city at a total of 8 different temples and shrines. To be precise, the event is hosted at Kasuga shrine, Gangō-ji, Tōdai-ji, Saidai-ji, Daian-ji, Yakushi-ji, Tōshōdai-ji, and Hokkei-ji. 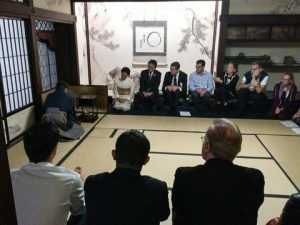 At these grand venues, some of which are protected as national and international cultural heritage sites, 7 different schools of tea ceremony collaborate to provide a whole week of tea gatherings. In between the venues busses are laid in to smoothen the transfer from one venue to another, and thousands of tea adepts and aficionados come from throughout the country to participate in this event. Tyas Sōsen and Stephen Sōshun serving tea to Arima Raitei, Chief incumbent of the golden pavilion in Kyoto. I, together with my tutor Stephen Sōshun participate in this gathering every year and serve tea at sessions hosted by our school of practice, Enshū-ryū. During the second and third edition of this event, we served at thick-tea sessions hosted at Yakushi-ji and thin-tea services at Gangō-ji. The image at the top of this post is from 2017’s service at Yakushi-ji. 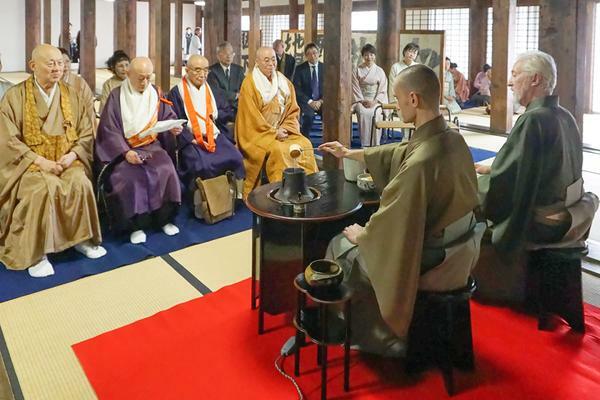 Last year the grand master of the Enshū tradition was invited to conduct a ceremonial offering of tea for the opening of the event, which was on February 7th. In succession, two services, one of thick-tea, and one of thin-tea were held to regale the attendees. Sōsen and Sōshun served thin-tea in the large meditation hall at Gangō-ji, where they employed the tenrai desk in a chair-seated service (see image above).